Where and What to Eat in San Francisco? 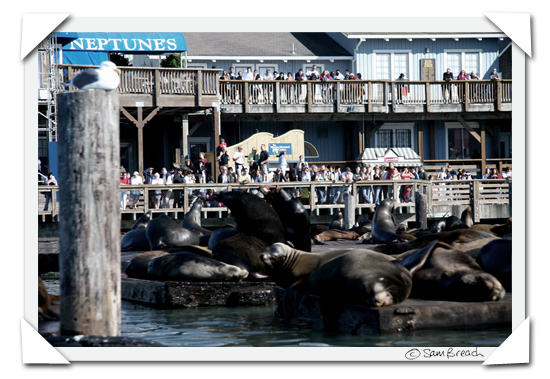 Watching sea lions in Fisherman's Wharf is hungry work for a San Francisco tourist - you have to eat sooner or later - but where? 1) English Devonshire Butter is now available in SoMa Whole Foods. 3) Fizzy Lizzy Soda is still not available at SoMa Wholefoods. I agree with most of your list except the Suppenkuche remark. I was first taken there by a German friend about ten years ago. Of course, that was many years ago. I know it's been at least five years since I have eaten there. From your remarks, the quality has obviously dropped. So sad. And the thing is that the friend who first took me there was the floor manager at Zuni before he returned to Germany. He never accepted inferior food. That's why I am sure that the quality must have dropped at Suppenkuche. L'atelier rules. Went twice to the one in Tokyo last winter. Excellent. Now I have to check oola or piperade or scott howard. I'll have to narrow them down a bit since we've only got 3 days there... but maybe your number ones in each catagory should suffice. You are so brilliant... just when you must have sensed that I needed some more links to click on while dreaming about the honeymoon... Just over a month from now we will he winging our way over there, with a quick stop for dinner in Babbo... Life is good! Right, must start booking dinners. By the way, have you eaten at Nua? It's owned by the brother of a friend of mine. Definitely going to check it out and send reports home. I just discovered www.blogsoop.com, which is a database that compiles restaurant reviews by foodbloggers in SanFran, NYC, and LA. You can sort out the restaurants by city, name, zipcode, neighborhood, or cuisine. It's pretty cool! Dagny - I tried - i gave Suppenkuche a second chance, it's just not my thing. Ced - Scott Howard is my current favourite. Oola has gotten a little tired but we go just for the ribs. Piperade is alsways good if you can get a reservation. Bonnie - i didn't number them in any particular order so number one doesn't necessarily mean my favourite - to the contrary in some cases. Email me privately if you want some more tips or have any more questions. Vanessa - Nua is one of my friend's favourite restaurants and I am going there for her birthday soon, I can't wait to try is because she absolutely loves it. sam I've just come over from enidd- I did tell her about mamma's and I believe she did try it out. I'd love to go to delfina "for real" with you and Fred! One thing in common between Coco500, Delfina and Scott Howard: they all do amazing things with squash blossoms. For this alone, they deserve our thanks. I'd personally add Range - which added squash blossoms to its green tomato sauce they serve over their Vegetable gratin entree. Their current policy of requiring a card to hold a reservation on opentable is irksome, but I am constantly impressed by how good anything they cook (and mix) tastes. Pricewise, these places are a good deal compared to what you get in a comparable London eatery (I always benchmark against St John), but not by much. St John has appetizers at about 7 pounds, and mains around 15. Consider no tax added, and tip added at 12%, not to mention wines at similar prices, if not still a bit cheaper ... I'm not sure I'd be doing cartwheels in SF. Have the pound drop a bit, and these places get expensive for UK folks. I think this calls for another controlled experiment. Sam - here are the chinese suggestions. First off - these are not in the city - my old favorite is gone and I don't know enough to recommend a replacement - plus I'm pretty sure these are better than anything in the city itself. dim sum lunch and dinner - best in the bay area witout a doubt. 2) Restaurant Peony in Oakland CHinatown. Dim Sum and dinner. In some ways beter for dinner even though its reputation (and reality) for dim sum is excellent - problem is that the wait to get in for dim sum is often well over an hour. I'm afraid I mostly go with a friend who is a close friend of the owners and we usually just walk right past the line. But there is no wait for dinner and the food is excellent. You can stretch your comfort zone a bit here. 3) East Ocean Restaurant in Emeryville - VERY upscale dim sum (only I think) with great views of the bay - sort of like Yank Sing but bigger and better - this is 'fancy' dim sum - everything very neat and clean - less of the chicken claw and jellyfish, more of the deep fried stuff. One more - a drive to Sonoma for a winery tour trip - my brit visitors usually really want to do that. Someone has to be a designated driver but it is usually a great trip. I like Sonoma better than Napoa for this because it is less crowded, prettier and many wineries are totally free and have snacks. I hope I make over there one day and get to sample a few of these places. For somebody who doesn't do memes, you sure do a meme good. And I do hope everybody's okay in England as it sounds like they're going to be entirely underwater soon. Love Zuni Cafe, Mama's, Bocadillos, Foreign Cinema and Gary Danko (though, I agree, it does hurt the checkbook). Cafe Gratitude drove me insane!! All of that excruciating courtesy and "What are you grateful for?" ridiculousness!!! Pfft! Very bummed to hear about Suppenkuche, though, as I am about to go there for the first time for a friend's birthday. While this has been the year of California for me, I still haven't made it to San Francisco. I have however tried out In N' Out Burger while in California, after hearing so much about it. But I have to say, I was kind of disappointed, especially in the fries. Do all Californians love it? Sam -- Thanks for the thoughtful list that incorporates different cultures, costs, and styles. That's why we love it here! You've done a favor for lots of people who might otherwise spend far too much on less than sparkling experiences. If your expectations are set too high for In-N-Out, then you are likely to be disappointed. I was my first time there. However, on the second and third time I finally "got" it and started to really like it. You know, it's not "monster burger" or "gourmet burger" or anything like that. It's just a simple burger with or without cheese. And fries. It's a weird concept for a fast food chain (limited menu, fresh cut fries, "secret menu"), but it's one that is pretty well loved here in CA. For someone who eats traditional fast food (ie, burger chains) only a few times a year, In-N-Out remains my favorite. The food is tastes better and I don't feel disgusting afterwards like I do at the others. However, in the end it's just a burger chain - one that's in the process of expanding and becoming more like Wendy's, Burger King, etc. (you'll have to read the saga regarding the change in family ownership to understand). Off-topic, but I noticed only a small sea lion family when I dropped by the wharf with some visiting relatives from Canada on the 14th. I can't remember if that's normal or not. I seem to recall a much larger sea lion colony. Great list. This is now part of the packet I give to new colleagues to the day job who just moved to the Bay Area. Thanks sam. I did not know there was an IN/OUT at the Fisherman's wharf. I shall be attending some classes at Tante Marie this august so I'm figuring out where to eat. I really want to go Slanted Door at the ferry bldng. this time around and I might try Zuni Cafe again. sam, thanks so much for this - and sorry it's taken enidd so long to thank you. she's been deep in cardboard and a new job. (they're not related.) enidd will browse this in depth this evening, if she gets an evening. enidd - sam and the frenchman tried delfina last night on a whim, late, (sat next to a table of visiting Brit women from what I heard) but the frenchman wasn't impressed. He had salad and spaghetti, but the spaghetti wasn't the way he likes it and he has strong opinions on that. I had a squid appetizer to die for but I didn't so much care for my bunny main because I kept getting mouthfuls of gristle and bone. The accompanying potatoes were perfect. Delfina is a mixed bag I think (it was my 3rd visit but his first) - the frenchman LOVES the pizza next door though and i mean LOVE. So do I.
delfina pizza it is, then! although a newbie, you seem to have so many interested readers, enidd will add her favourites to the list. spork on valencia - the only place she's visited twice. the pork was amazing, as was the brownie in a pot. oh, and the goat's cheese. panchitas no 3 on 22nd (one visit) is poshing up mexican food nicely - no replacement for a burrito after too many tequilas, but excellent if you fancy mexican, candles and red wine. the organic japanese on mission - enidd's memory is failing so she forgets the name - is excellent and good value. and for local, unknown mexican at bargain prices, try mis antojitos - 22nd and something like folsom. best guacamole in enidd's life, ever. the bloke makes it there and then in front of your eyes, and tops it with quesa fresco. the camarones diabolos are fab too. drinking - enidd's favourite bar is homestead - zinc ceilings and dylan thomas quoted over the bar. fight against the dying of the light, that's enidd's motto. thanks sam, enidd has read through these and she thinks her visitors will be very happy. Thank you so muche for the list. I'm going to San Francisco for september! we're moving up to la honda from los angeles in two weeks and then to the city the year after. we'll be checking out alembic as soon as we get there. Visiting from Seattle and took your advice on Coco500 and *really* enjoyed it. Burrata. House made garganelli, corn, pesto beurre blanc. Wild mushrooms & gremolata. Squash blossom flatbread. All very very nice. Thanks for the suggestion.